Sky King is a 1940s and 1950s American radio and television adventure series. The title character is Arizona rancher and aircraft pilot Schuyler (or Skyler) "Sky" King. The series was likely based on a true-life person, Jack Cones, the Flying Constable of Twentynine Palms during the 1930s. The radio show, based on a radio story by Roy Winsor, was the brainchild of Robert Morris Burtt and Wilfred Gibbs Moore, who also created Captain Midnight, first aired in 1946. Several actors played the part of Sky, including Earl Nightingale and John Reed King. Like many radio shows of the day there were many "radio premiums" offered to listeners. On November 2, 1947 in the episode titled "Mountain Detour" the Sky King Secret Signalscope was used. 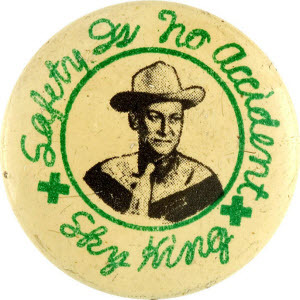 Listeners were advised to get their own for only 15 cents and the inner seal from a jar of Peter Pan Peanut Butter (produced by sponsor Derby Foods). The Signalscope included a glow-in-the-dark signaling device, whistle, magnifying glass and Sky King's private code. With the Signalscope you could also see around corners and trees. The premiums were innovative, such as the Sky King Spy-Detecto Writer, which had a "decoder" (cipher disk), magnifying glass, measuring scale, and printing mechanism in a single package slightly over 2 inches long. Other notable premiums included the Magni-Glo Writing Ring, which had a luminous element, a secret compartment, a magnifier, and a ballpoint pen all in the crownpiece of a "fits any finger" ring. The radio show ran until 1954, being aired simultaneously with the television version. To play or download a single file just click on it, this opens up play page. Then click on any file and download link is at bottom right of page. Click on Download Page to pop up the download box for full view. The television version stars Kirby Grant as Sky King and Gloria Winters as his teen-aged niece Penny. Other regular characters included his nephew Clipper, played by Ron Hagerthy, and Mitch the sheriff, played by Ewing Mitchell. Unlike many "lawman-acquaintance" characters on other shows, Mitch was competent, intelligent and skilled. He was always coming to Sky for help, due to friendship and recognizing the utility of Sky's flying skills. Other recurring characters included Jim Bell, the ranch foreman, played by Chubby Johnson as well as Sheriff Hollister played by Monte Blue and Bob Carey played by Norman Ollestad. Many of the storylines would parallel those used in such dramatic potboilers as Adventures of Superman with the supporting cast repeatedly finding themselves in near death situations and the hero rescuing them with seconds to spare. Penny was particularly adroit at falling into the hands of spies, bank robbers (the best place to hide stolen loot was apparently in the Arizona desert) and other n'er-do-wells. Like most TV cowboy heroes of the time, Sky never killed the bad guys, even though one episode had him shooting a machine gun into his own stolen plane. Largely a show for kids, although it sometimes aired in primetime, Sky King became an icon in the aviation community. Many pilots (including American astronauts) who grew up watching Sky King name him as an influence. Though plot lines were often simplistic, Grant was able to bring a casual, natural treatment of technical details which led to a level of believability not found in other TV series involving aviation or life in the American West. Likewise, villains and other characters were usually shown as intelligent and believable, rather than as two-dimensional. The writing was generally well above the standard for contemporary half-hour programs, though sometimes the acting was not. The later episodes of the television show were notable for the dramatic opening with an air-to-air shot of the sleek, second Songbird banking sharply away from the camera and its engines roaring, while the announcer proclaimed "Out of the blue of the Western sky comes . . . Sky King!" The short credit roll which followed was equally dramatic, with the Songbird swooping at the camera across El Mirage Dry Lake, California, then pulling up into a steep climb as it went away. The end title featured a musical theme, with the credits superimposed over an air-to-air shot of the Songbird, cruising at altitude for several moments then banking to the left and turning away (similar to the opening shot). The show also featured low-level flying, especially with the later Songbird. Many shots showed the Cessna "down amongst the rocks and the trees," a way to show the speed of the plane as the desert flashed by in the background.